In August of 2015, Walt Disney World announced the Frozen themed additions at the D23 Expo 2015 Parks and Resort Convention. Here is a video that better describes the vision of the new Norway Pavilion. One of the other new additions will include a new character greeting location where guests will have the chance to meet the royal sisters, Anna and Elsa. 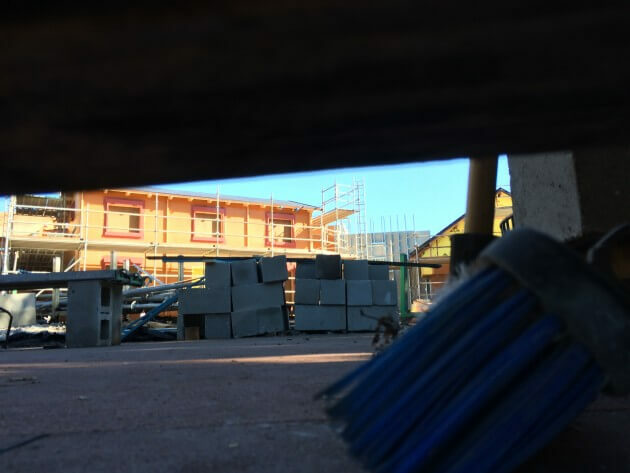 The Royal Sommerhus is to be over 13,000 square feet and is expected to open in the spring. 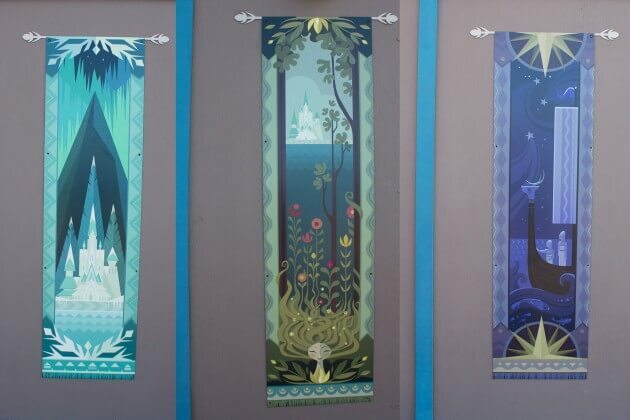 The construction walls are even decorated with Frozen inspired banners! Under the construction walls, you can see some of the building shapes coming together. The new ride is scheduled to open this spring. 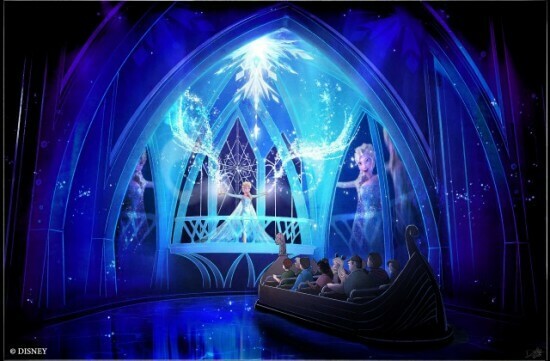 Guests will be transported to the Summer Celebration where Queen Elsa creates a special day for the Kingdom of Arendelle. 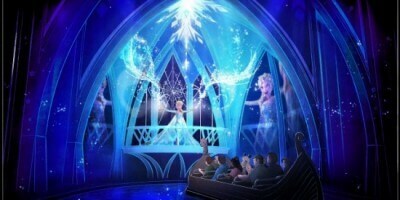 Guests will also visit Elsa’s Ice Palace while riding this attraction. Are you ready for the new additions to the Norway pavilion to open? I sure hope they get it all put together quickly! I am hoping to take my kids to WDW this March but we won’t be booking until we know a date of opening for this ride. My 6 year olds DREAM! I heard May 1st! We’re going a month before! Bummed!! I think this move from Maelstrom to Frozen Ever After is a tasteless, rare call on Disney’s part. Other than character greets, no fictitious Disney character has permeated the World Showcase AS IT SHOULD BE to keep with the spirit of giving guests the taste of a land and culture from afar. Furthermore, Frozen is set in a fictional kingdom, not Norway, which even further smacks of Disney, Inc. trying to capitalize on every dollar it can wring from Frozen. It’s shameless. Epcot’s World Showcase is the one place adults can enjoy a little character-free, mature entertainment, it’s a nice contrast to the teetotaler-every-storybook-character-land Magic Kingdom and now greed will ruin it. I have a 2 Yr old and 5 yr old…there should be a kid-centric park and an adult one, too. I agree. Although I see why Disney wants to have a FROZEN attraction (as it should), it would be better served at the Magic Kingdom which caters more to the little ones. Epcot world showcase is a great break from the craziness of the kiddy ride scene, and has a more chill vibe for us adults, and adding Frozen here will just bring the Magic Kingdom madness we are trying to escape from to Epcot. 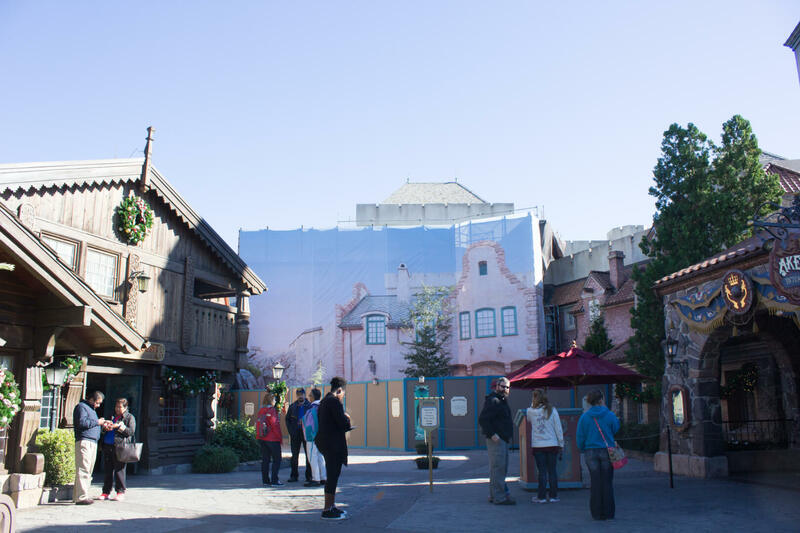 Also, being part Norwegian, I am a bit offended that the Norway pavilion is being turned into a fictional Disney area. Not cool Disney, not cool. Nobody complains about Donald and the other Caballeros in Mexico because they’ve been there for a while. They tie in to the pavilion appropriately, as will the Frozen theme in Norway; the film is rife with Norwegian myth and story-telling. It’s okay to like things kids like too. It’s pretty simple – don’t like Frozen? Don’t ride the ride! Donald and his feathered friends take a ride through “real” Mexico though so that is in no way equivalent to Anna and Elsa going through a fake Norway. Unless they do the same style and it’s Anna, Else, Sven and Christof leaving fake Arrendal for a trip through real Norway? Keep in mind Malestrom was a ride through a mythological Norway anyway, so that is probably their justification. In all honesty it’s an attempt to save a dying park “on the cheap”. What they needed to do was upgrade future world. If doing anything in Showcase it would be add another country, they are still 6 countries short. Disney is redoing DHS and AK and people like you complain about the construction. They will do Epcot next I’m sure, and it is surely not dying. How much do you want them to do at one time ? They have 4 parks at WDW, stop being hypocritical. You sound like you need to go to Vegas, and let another family take your 2 and 5 year old to Disney parks. Characters are represented in almost every country at World Showcase. Whether your a fan of Frozen or not it’s success and popularity will help Norway which was not too long ago rumored for replacement as World Showcase. I’m going to agree as well. I don’t have kids and my girl friend and I look foward to all the parks. That said the more adult idea behind Epcot is lost when you commercialize it in a way that wouldn’t happen if Walt was around? My main issue is the magical disney folks that helped us set up our trip. It would have been useful to know what wasn’t operational when we were asking questions. Magical isn’t so much when you aren’t clear about what you’ll be missing after traveling over 1,000 miles to see Mickey! 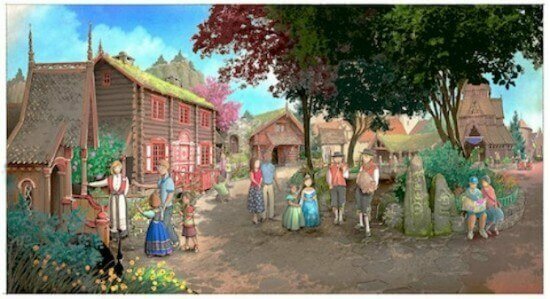 Like Monsters Inc and Stitch’s Great Escape, this one was written by the Armchair Imagineer fans (you built it, fans, you’d better danged well ENJOY it…), but the upside is that the rest of Norway gets a huge exterior upgrade as well, as you can see from the concept art. Hopefully, it’ll be enough of a camouflage to get by, even if, like the two other examples, getting the attraction will prove not to be as good as wanting it. Maelstrom – Under New Management. Perhaps it will meet a similar fate…..whereas Iago angered the tiki goddess Uh-Oa, Elsa and her cohorts will be hacking off some very unfriendly triple-headed trolls who decide to send her down, down over the falls. Doubt it dude, gonna be huge !!! The World Showcase also hosts Gran Fiesta Tour Starring The Three Caballeros in Mexico. So Elsa is only the newest and not the first fictitious character. Dumb. frozen is a good, popular movie and will breath life into Norway, which was considered one of the worst countries in the World Showcase not too long ago. World Showcase is not character free and should not be an Adults area. Wow! People get behind their computer and complain about anything they can. Don’t know why I bothered to scroll down, other than I was looking for more info. Anyhow, what a bunch of hyper-critical Grinches on here! It’s Disney people!!! Disney opened these parks, Disney owns these parks and I happen to like all things Disney as what Walt Disney created is amazing and when you all come up with your own NEW imaginative ideas, write and produce your own movies, and open your own theme parks, you can run YOURS any way you want. Have you heard the saying “Everyone wants to be the boss until they are”? Totally agree, lets just see before we start complaining. Frozen has taken its target age group by storm. Disney is a family destination, focused on the entertainment of the children, and the children at heart. Little children will love it, and that is the whole purpose of waiting in lines, spending large amounts of money, and dealing with Florida heat, to bring a little magic into your kids childhood. The Norway culture has a large story telling component, as do most cultures, the ride will fair nicely I think, and I’m sure Disney will pay enough respect to Norway as a country in the world show case as to not degrade it. I for one am excited for my little girl, and boy for that matter, to get to experience something thats been such a large influence on their age group. I was also hoping to information on the opening date. I will there April 16 to the 23rd and hoping to hear that a possible soft opening might be possible during my visit. This is interesting to read. Everyone has their own perspective, even in my family. Maybe because EPCOT is “Adult” themed and I am a kid at heart, I believe each country should have some sort of a Ride. EPCOT ranks as the favorite park for my wife and her family BUT is competing for my least favorite with AK. (Only because AK is so spread out and lacking attractions BUT getting better) I like rides and am Cheap. They don’t like rides and enjoy going from country to country buying food, drink and shopping. Take away the food and drink, most of the world showcase is just a long walk around the block. I don’t hate or even dislike EPCOT, just enjoy the other parks more. I don’t consider watching a movie/commercial about your country as an attraction. I enjoyed the ride in Mexico and the Maelstrom in Norway. It doesn’t have to be a thrill ride but each country should have something. Does anyone know a date for opening? I so wanna bring my grand girls. All official posts now say “this summer”. Clearly they are behind schedule.